Normally when driving on a bumpy, dirt road along the rim of a canyon in the darkness of night we are heading home after a long day of canyoneering. Not on this night. On this night our legs were fresh and our wetsuits dry as we headed towards and not away from our adventure. With no moon and the tree canopy blocking the little bit of ambient light from the heavens our visual world was limited to the narrow channel of illumination created from the bouncing headlights. Some sort of cat, presumably a bobcat sprinted across that channel of light and then we saw a magnificent herd of elk including the bull with its giant antler rack. “This is going to be an exciting night,” I thought. As we parked at the head of the canyon, the thermometer in the car read 45 degrees. Headlights were replaced by headlamps as we got our gear situated. At 7:30 pm we began weaving through the forest and into Bear Canyon. 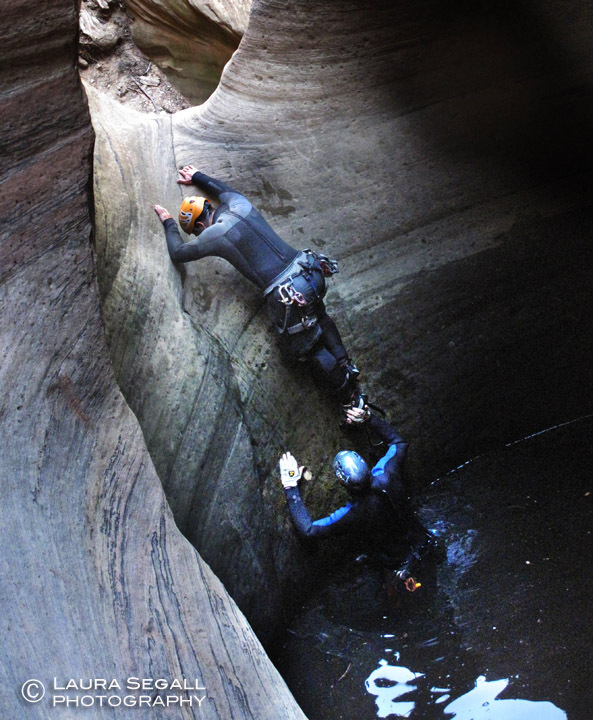 All three of us had descended Bear Canyon before and the consensus was that even though Bear Canyon contains a beautiful section of short Coconino sandstone narrows, it just doesn’t possess enough challenges to make it a truly classic canyoneering descent. As pools and down climbs began to present themselves what I remembered as being unchallenging took on a whole new light in the darkness of night. 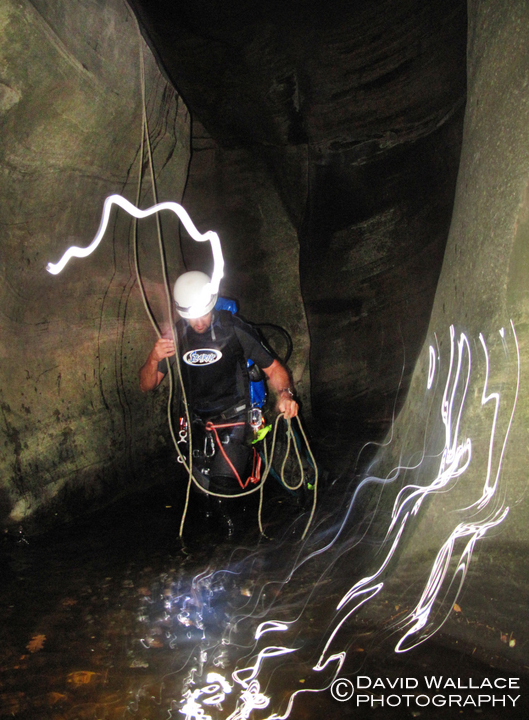 As those narrows encapsulated us we took the opportunity to shut off our headlamps and briefly let our eyes adjust. Our pupils could not compensate. Only a thin sliver of stars could be seen overhead and everything else was a complete and total absence of light. The narrows were filled high with unquestionably cold water making for several longer than remembered swims. During night just like day those wonderful narrows ended far too soon, the canyon widened and after another half hour of careful maneuvering we made our way into West Clear Creek. As we passed a vacant campsite we took advantage of a fire pit and pile of wood and made a quick campfire. The fire was nourishing and stimulating both to the body and the eyes. It also made the transition from wetsuits to clothes all the more pleasant. John doused the fire with several helmet-fulls of water from West Clear and we raced up the trail and out of the canyon. Eric gets his stuff ready. John walks through the narrows. Cold and clouds made for a Cheery-Oh day of canyoneering. Chris, Jessica, David and I descended El Capitan Canyon which parallels Highway 77 south of Globe last winter. For some reason, that is beyond me, David and Jessica decided to talk in British accents for the entire trip. El Capitan Canyon has a few rappels a short section of narrows and a really cool rock tunnel that you have to walk through after the second rappel. Once the technical section is over it is an easy hike out on a dirt road back to the car. Cold and clouds made for a Cheery-Oh day of canyoneering. Chris, Jessica, David and I descended El Capitan Canyon which parallels Highway 77 south of Globe last winter. For some reason, that is beyond me, David and Jessica decided to talk in British accents for the entire trip. Maybe it was the dreary weather. Jessica hams it up for a photo as Chris looks on in El Capitan Canyon. Chris sets up a rappel.